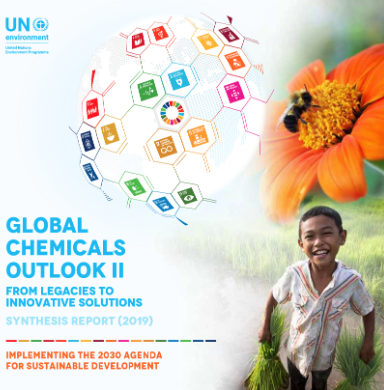 The Global Chemicals Outlook II – From Legacies to Innovative Solutions: Implementing the 2030 Agenda for Sustainable Development, mandated by the UN Environment Assembly in 2016, seeks to alert policymakers and other stakeholders to the critical role of the sound management of chemicals and waste in sustainable development. It takes stock of global trends as well as progress made and gaps in achieving the global goal to minimize the adverse impacts from chemicals and waste by 2020. The Global Chemicals Outlook II finds that the global goal to minimize adverse impacts of chemicals and waste will not be achieved by 2020. Solutions exist, but more ambitious worldwide action by all stakeholders is urgently required. The Synthesis Report is being launched on 11 March 2019 at the fourth session of the UN Environment Assembly. A shorter Summary for Policymakers was tabled as a working document of the fourth session of the United Nations Environment Assembly and is available in all six UN languages. The full Global Chemicals Outlook II will be launched in April 2019 at the third meeting of the Open-Ended Working Group of the International Conference on Chemicals Management.